125 wow! !..just wish they would’ve included the order of the names -.- and may i just say how refreshing of a thought it is to know these women lived such long lives and their former “owners” were probably already DEAD or depressingly decrepit. Wow, the difference in their diets compared to us today. Since they were poor, the did not have meat always as an option to eat. They ate alot of greens(vegetables) so their bodies maintained their healths. Our bodies are made up of organic matter so we should only be putting organic matter inside of them. Cancer is spreading fast. On top of this these ladies had hard lives. I hope their latter years were amazingly great unlike their slavery years. Pork was readily available. It was usually the parts the so called “Masters” did not want. One great benefit was the foods did not contain steroids, chemical fertilizers or pesticides. Also Prayer and Faith. Africa slaves were resilient in harsh conditions it was nothing for Africans to be well over 110. White people always had short life span. As far as the diet and disease Africans understood botany and alchemy. Inspite how the whites treated her, if you understood Ancient African history you wouldn’t be surprised. All of the things that you mentioned is what made these women remarkable. With all of these ‘facts’, that you introduced into evidence, I would think you knew that the number of slaves with birth certificates (an official document is public records) would be zero to none. So they weren’t allowed birth certificates but they knew their own age?? Slaves were not afforded birth certificates as whites during slavery as they were considered chattel. Documentation would be found in the books of the slave owner’s increase of property. It is possible that documentation was found in regards to all of the women as well as their consciousness. These Ladies were most likely Mammies= nannies who raised white children in the home. Mammies lived with the family or spent many hours a day in the home caring for children and perhaps cleaning and cooking also. If anything good could be said about south, it was the Mammy who nurtured it. Most of these professionals worked for several generations of the same family. Any family not wishing to care for their Mammy in old age was not a decent family. All assumptions you know nothing about the Africans and their resiliencies. To much TV for you. And your point is what? “Good, about being a mammy”, what good? Patty^^^ you sound like a hater… that is a lie about slaves only living to 50 years. What didnt kill them or break them, only made them stronger. And all slaves didnt get sick like the members of masters family. There is a movie/autobiography called Miss Jane Pittman, who lived to 110. but that is right most older slaves past 65 did go to lighter duties or worked in the house. It was common for the family to take care of the elder slaves. 98% of births and marriages and deaths that happened on the plantation were recoreded in the plantation manifest. Birth Certificates did not start till 1914. “Bahá’u’lláh once compared the colored people to the black pupil of the eye surrounded by the white. In this black pupil is seen the reflection of that which is before it, and through it the light of the spirit shineth forth.”—‘Abdu’l-Baha, quoted in The Advent of Divine Justice, pg 31. This observation seems particularly poignant with regard to this photograph and these women. Nobility, dignity, and perseverance are among the qualities summoned to mind by this photograph. 1916 was 53 years after the Emancipation Proclamation (January 1, 1863). But as we now realize more clearly from our 21st Century vantage point, little changed during those 53 years in the arenas of racial discrimination, racial attitudes and race unity in America. 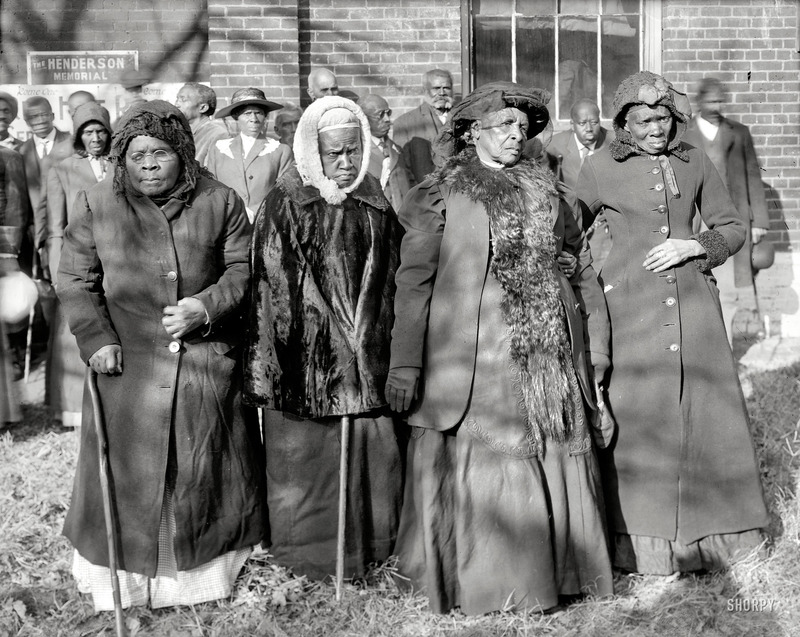 These women probably still lived under the apartheid of the American South where all of their civil rights were circumscribed and many of their sons and brothers and husbands were re-enslaved under a new system of involuntary servitude abetted by a corrupt criminal justice system. (See Slavery by Another Name by Douglas C. Blackmon) Also they are women. 1816 to 1916 was not a century of light for females of any hue, even though the first rays of their emancipation were beginning to dawn. I was particularly struck by these women being dressed in their best finery for the period. It is an arresting and thought provoking photograph. Jerald- Why is Patty a hater? So some one who is skeptical or questions the veraciity of some one’s statement is a hater. That doesn’t make sense. People- all people did not live long in the 18th and 19th centuries. Compound that with horrible working conditions, a poor diet, lack of any medical care, and you have a life expectancy that was around 50 years or so. The oldest woman who ever lived was 122 when she died in 1997. You seem to be re-writing history. There was yellow fever, dengue, smallpox, malaria, dysentery, an infected tooth could kill you back then. There was no modern sanitation, people were often infested with thousands of fleas at one time. Rats carried disease. It is highly unlikely that any human being could have survived for such a long time. This has nothing to do with race or politics. I also question this article’s accuracy. You white people lived corrupt lives knew nothing about diet and health, you guys hated then and now. You know nothing about the African race. The only thing you guys know is what you see on tv and the lies that were told people who believes anything. Just because food is “organic” does not mean it isn’t spoiled or contaminated. Many people in slavery were not getting enough calories, period, let alone the nutrients of a healthy, balanced diet. In addition, people in the 1860s died much more frequently from things other than nutrition: accident and infection were far, far less treatable than they are today. It’s a shame that you Blacks knows nothing about your ancestors. If you don’t understand the past you can’t go forward in the future. It’s obvious that you know nothing about African history. Black women of the slavery era, were filled with tenacity, determination to live above the circumstances forced upon them with the intent of dehumanizing them!! Those of you who question their ages, could never understand this. You don’t have a clue about what it REALLY means not only to be a survivor, but also a victor!! I question their ages, but I’m confused not only because my name is Victor, but also because I’ve survived my whole life. Does this make me a black woman? I hope so, cuz I need to get my hair did, and some food up in dis mug on my government check. Patty the fact of the matter is the slave owners tried to give the slaves the worst food but they were to smart.The slaves made the best out of the food they where given and trust and believe these women were in very good health.That’s how most of them breast fed little white babies,cooked meals,cleaned and had to satisfy the master because deep down they really couldn’t stand their wives.It’s 2014 now you should know black don’t crack! !